We were on a very short get away from school on 22nd and 23rd of July, literally - getting away from school, not for a holiday though. Mr. Aidan Leo was representing SMK Dato' Jaafar and the Johor Bahru district for the State Level Public Speaking Competition. I decided to put up a night there on Sunday as the event would start early on Monday morning. It was a long, winding and bumpy road to Mersing from Johor Bahru. We left school at 12 noon and arrived there at about 2.00 p.m., 130 kilometres traveled. After checking in at Havanita Hotel, we went out for lunch at this place I used to visit a long time ago at the jetty, and got back to the room for a short nap, as it was raining outside. I had a slight headache, must be from the long distance driving and that could be a sign of old age setting in. Lucky enough, the rain stopped before 6.00 p.m. so we had the chance to walk at the beach and to get our freshly fried "keropok lekor" as well. Someone had to practice his speech before the real competition - at the beach! As it was already past 7.00 p.m., I decided to stop for dinner at a nearby stall at the beach. By doing this, we did not have to go out to hunt for food anymore once we got back to the hotel room. Too bad I did not have enough time to explore Mersing town. 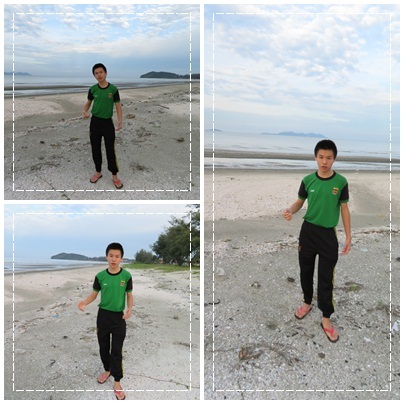 We left Mersing the next day at about 4.00 p.m. after the prize-giving ceremony was over. Hopefully I could come back to Mersing one more time, just to relax and enjoy the laid back atmosphere of the fisherman's town one of these days.